73" wide stunning cabinet with rich dark brown veneer finish will transform your bath into the most luxurious and beautiful bathroom possible as it enhances the appeal of your grand home. Features attractive golden borders on the doors and the panel below the sinks has ornate patterns of leaves. The large four door storage compartments with shelves and three useful drawers between the two sinks allows for ample, easy bath storage. Ships fully assembled, pre drilled faucet holes and big cutout back behind the sinks for easy access to plumbing installation. 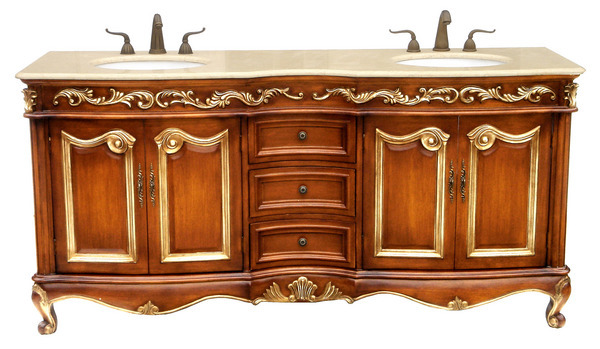 73" Marilyn Traditional vanity double sink cabinet. Ships with sinks and cream counter top, as shown. Faucets sold separately. Freight is $265.00 or less, depending on shipping destination.